If you like moving fast and hitting hard, you'll enjoy going up the T-62A line. Adaptable and well balanced, this line rewards measured, aggressive play. An experienced tank commander can function well as a "lone wolf," but these tanks are also excellent pack hunters. Working around the flanks and getting to the sides and rear of an enemy vehicle, a platoon of Soviet medium tanks is a nearly unstoppable force that can change the tide of many a battle! While this Soviet medium line doesn't have the raw firepower of heavy tanks, they are highly mobile and capable of lending aid to a flank under attack or supporting a faltering advance. Similarly, if your base is under threat of capture, these tanks give you the flexibility to rush back to reset the cap! We want to help you get the T-62A as fast as possible, so we've created all the Discounts, Credit bonuses and Missions a determined commander could want. 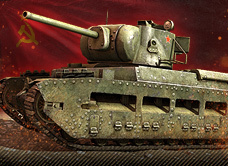 Along with bundles of Garage slots to put your new tanks in, Gold and a Premium medium tank to train your Crews up right, this is a deal that is not to be missed as you unleash your inner wolf and hunt down the swift and deadly T-62A! Complete On Track to the T-62A four (4) times. Complete On Track to the T-62A eight (8) times. Complete On Track to the T-62A ten (10) times.